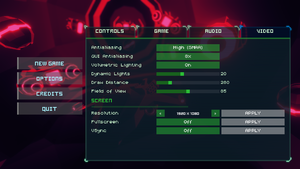 In fullscreen mode, setting only affects the renderer resolution and the game always upscales to desktop resolution. Slider under Video Options. 70° - 100° Hor+. FXAA (Low) and SMAA (High) + GUI anitaliasing. Slider. There is a limit on how fast the player can turn, making it seem like there is negative mouse acceleration. Mice tend to be less responsive on Linux. Developer recommends increasing sensitivity in the control options for now. 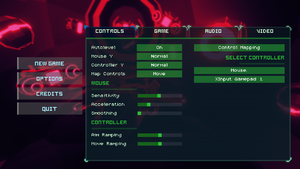 Separate option present for a controller. Supports XInput and DirectInput controllers. Separate option present for a mouse. All story is told via text only. 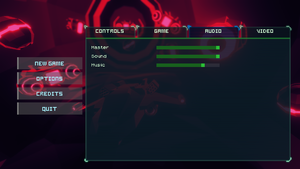 See Helix Mod: Sublevel Zero. Some AMD cards and drivers (particularly, in our experience, the proprietary drivers) crash when using antialiasing in Unity. Some users may have issues with switching resolutions. Developer reports it may be a Unity-wide issue. Volumetric lighting is bugged on most cards/drivers. It's turned off by default in the Linux version but you can still try it from the Video menu if you like. You're likely to get white flashes and/or strange black triangles appearing. Developer is looking into solving this. When transitioning to the next level, often sounds stops playing. May be related to windowed mode.